One of the things that interests me in 2014 is whether or not T-Mobile is going to be sold. I work at a company that, among other things, runs a virtual network on top of TMUS’s network-so I’m definitely interested in what might happen. I keep thinking though, who else might want to buy T-Mobile’s network? The one dark horse I keep imagining is Amazon (this might be bias induced by the fact that I both live in Seattle and my wife works there-although she’d know nothing of their telecom plans). Now, why on earth would AMZN buy TMUS? You could imagine a world where being a Prime customer means that your Kindle Fire comes with unlimited Prime video anywhere in North America. Ditto for Amazon music served up by the cloud. Partner with Facebook for them to make their messenger app free. Yet another way to get people to pay $79 a year. Plus it also facilitates the launch of a Kindle phone (which could also include a free amount of minutes/data as part of a Prime membership). But what about existing T-Mobile customers? Simple: make them an MVNO. Rather than converting them all to Amazon, sell the T-Mobile brand and customer base to their management team and let them run it. But Amazon could take it further: offer SIM as a service via AWS. Amazon could create a new category for data-driven devices that piggyback off its existing infrastructure. Want to create a network of sensors that measure air quality across your city? No problem, just buy 500 SIMs from AWS and their pay-as-you-consume data service can be added to each unit. Cost too much? Just call up the console to shut off a couple of units. And data is free if you pass it inside the AWS cloud. Amazon could literally open up an entirely new category of services and end up owning the Internet of Things – even though all they set out to do was let people watch video for free. Let’s see what happens to TMUS. Whenever I find something I might want to buy, I park in on one of my many Amazon wish lists. I use their Web services both personally and professionally. And I’ve owned a Kindle for years; it’s the only eReader I’ll use. But I’m frustrated with Amazon as they’re missing a golden opportunity with the Kindle. Part of the reason is that Amazon is hard to pin down as a company. Most people think they’re for shopping; more sophisticated pundits think of them as the “platform for buying anything.” But then how does that explain their web services? The tablet? I like to think of them as a scaling company. They started by scaling retail. Before Amazon, if you wanted to buy most things, you went to a store and bought what was available; some folks skipped the store visit and bought from the limited set of items available in a catalogue. Post-Amazon, we expect to be able to buy anything across any category and have it fulfilled by Amazon. With the legendary Long Tail, Amazon scaled retail. Enter their Web services. Having built an incredible set of online services for internal use – and enabling themselves to scale quickly – Amazon realized that they could sell these same services externally and help others scale. Now there’s not a single startup that doesn’t use Amazon’s web services for elastic storage and computing; why would you waste time building your own cloud when you can use Amazon’s? You would be wasting time that could otherwise be focused on growing your business; Amazon helps your company scale. Which brings is to the Kindle. How does the Kindle reader and the Fire tablet fit in? A cursory analysis would suggest that they don’t: they’re just trying to fight the iPad and maybe scale the number of books you can read. But that doesn’t sound like a compelling narrative. What I hope that Amazon will do is use the Kindle to scale me. One of the biggest problems of this age is information overload. Imagine if the Kindle became the platform to manage this and therefore to help you basically scale your brain. Every time you read an ebook you highlight the passages you like and see those others like. You can do this today. Now imagine that this all lives in a website matched to your profile. From this website (or an associated app) you can upload a PDF and its converted into an ebook-style form that you can highlight; popular passages by others are automatically highlighted as well. Now Amazon builds a web browser that lets you bookmark web pages and clip/highlight sections and store them in this new “Kindle Brain” (they’ve already built a browser…). Throw in the ability to add notes and make everything searchable (notes, clippings and files) and you’ve got something interesting. You’re starting to scale my brain. But to really scale my brain, Amazon would use their awesome recommendation technology on top of all this. Every item in my Kindle Brain would contain related items that I’d saved, that others had saved and related products from Amazon’s database. I can now start to see the web that connects everything I ever learned; patterns I would otherwise miss become obvious. Now take it even further. Amazon has built an incredible database of my interests. Every day it goes out and summarizes everything I should read, all the time suggesting related products. And then they write their own search engine so that every time I search for something, it searches both the web and my Kindle Brain. Far-fetched? A bit. Completely unreasonable? No. Come on Amazon, blow my mind. A few days ago I noticed a tweet by Tim O’Reilly about car sharing. Turns out that GM’s going to use OnStar to let car owners rent out their cars when they’re not being used and Ford is going to contribute cars to ZipCar. Interesting to see two of the Big 3 getting into car sharing, but both of these pale in comparison with what Daimler is doing with its Car2Go service. The word “disruption” gets thrown around these days like it’s the new “hero”, but Car2Go is genuinely disruptive. Before explaining why it’s disruptive, a quick primer on how it works. 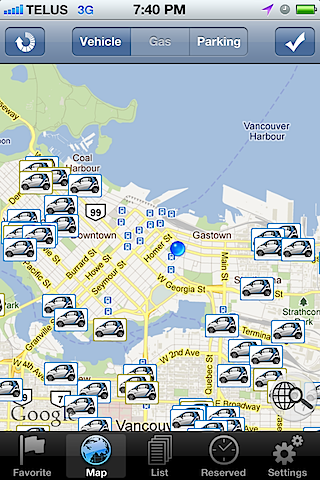 If you live in a Car2Go city (San Diego, Austin and Vancouver in North America), you pull out your iPhone and find a nearby car. You go to the car and start your rental by tapping a car against the window. You then pay by the minute, hour or daily maximum – whichever is cheapest for you. 1) You get incredible peace of mind: you don’t pay for gas or insurance so you never have to think about the car itself. 2) You can park the car anywhere (technically anywhere with permit parking or select reserved spots). This is incredible: point-to-point driving; no more returning the car somewhere (GM & Ford – pay attention to this). 3) The price is about a third of a taxi and comparable to the bus. The price of the car starts at $0.33 per minute, which sounds high until you actually look at your bill. I frequently get a car to drive to/from work. It takes as little as six minutes and is never more than about eleven. The bus costs $2.50 and a taxi is $12.00 plus tip. If I meet my wife downtown for dinner it’s cheaper to drive home than to take the bus. Even though a ride may cost a bit more than the bus, after I price in my time, the scale tips to Car2Go (even if I have to walk a few blocks to pick up a car). 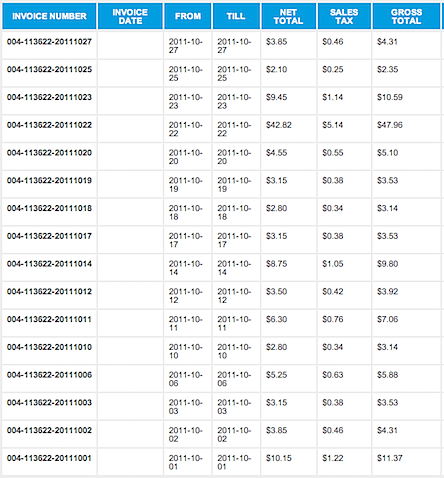 I used a car 16 times last month and it cost me $129.32. That’s an average ride price of just over $8.00. To put that in perspective, to lease a Smart Car (the same ones used by Car2Go) would cost at least $159/month. My car-owning friends tell me that insurance in BC is about $60/month. And don’t get me started on gas or parking. I’m saving over 50% versus what I’d otherwise pay, easily a couple of grand a year. But these are small prices to pay. As a business, it sounds like the service is taking off. Within 100 days of launching in Vancouver, they’d signed up 5,000 people doing more than 4,000 rentals a week at an average rental period of 30-50 minutes. That’s not a great business yet – maybe $3M a year in revenue – but the growth is meteoric: usage is up 4X since launch. This could be a serious business soon. 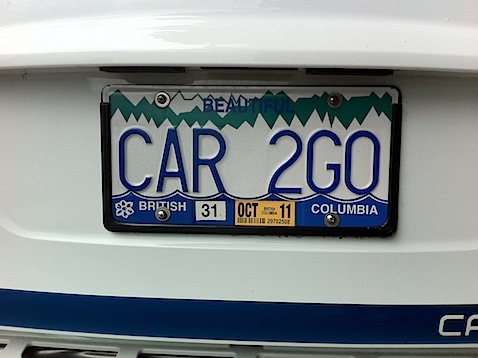 Car2Go doesn’t release any profit info for Vancouver, but given that every car is identical (and that parent Daimler is also the manufacturer), they’ve easily got the lowest fleet costs of any ride sharing service. If you’re lucky it’ll be coming to your city soon; it’s definitely changed how I live in mine.